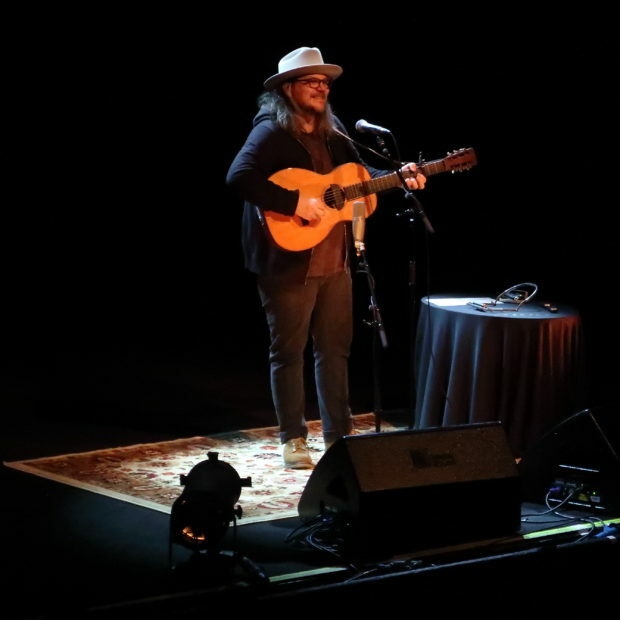 Jeff Tweedy is in the midst of a short solo tour that finds him roving through Canada and which ends with a show at Princeton University.. Jeff will return to the NYC area in June for two dates as part of the Clearwater Festival up in Croton. But earlier this year, Tweedy traveled through Europe including a special night at Vicar Street in Dublin as the opening night of the tour. Friend of the site Joe was there to capture the Dublin show, a night filled with many classic favorites and much banter and fan interaction, but which is most noteworthy as the live premiere of the new Jeff Tweedy composition “Don’t Forget We All Think About Dying”. The song has been played a handful of time since Dublin, including once on the current tour, but Joe’s recording is the song’s world premiere. Joe recorded this set with portable microphones from the front and center of the balcony. The quiet acoustic music and the generous crowd participation created some serious editing issues, but overall this is a quality listen. Enjoy! Our recording of one of the earliest Tweedy performances, at last year’s Mountain Jam, caught fire on the Internet. Before that show, I wasn’t sure what to expect from the new father-son band. While that performance was good, it didn’t fully predict the quality of the now-released Sukierae album, which (in my view) compares favorably to some of Wilco’s more recent efforts. Now, just over a year on, Tweedy is a force of its own, as Jeff and Spencer Tweedy let us know forcefully when they played Wilco’s Solid Sound Festival. This sprawling two hour and fifteen minute set, replete with covers, Tweedy songs, Wilco songs, songs from other side projects (Loose Fur, most notably), and special guests, seems like a window into what Jeff Tweedy wants this band to be. If Wilco will always be the man’s flagship and true moneymaker, Tweedy is where he gets to have fun. Here we have the Tweedys joined by all manner of Solid Sound guests, from Nels Cline to Ryley Walker, Bill Frisell to Cibo Matto. Would Wilco cover a Madonna song? Probably not — but with Tweedy, it didn’t even feel out of place. The set’s final number, a rousing “California Stars,” featured just about everybody on stage, and though this took place on the East Coast, the moment captured the wistful romance of that song perfectly. Our friend gr8fulpete recorded this set with Neumann KM185 hypercardiod microphones. Other than some gusts of wind noise that can’t be avoided, the sound quality is excellent. Enjoy! Please, be kind and don’t repost the direct download links. 21 Chinese Apple [Loose Fur] ! If you enjoyed this recording, PLEASE SUPPORT Jeff Tweedy and Wilco, visit their website, and purchase their official releases at their website [here]. We’ve written about Wilco and Jeff Tweedy a lot in the years of this site, in part because Wilco continue to be supportive of what we tapers do, but more importantly because they’ve continued to refine and expand their live show, making for something worth recording. For Jeff Tweedy’s inaugural Mountain Jam, Tweedy decided to serve up a slew of new songs (twelve, to be exact) , as well as some of the best-loved Wilco classics including “Jesus, Etc.” and “I Am Trying To Break Your Heart”, as well as the always-poignant “California Stars” from the band’s collaboration with Billy Bragg. The new tunes will appear on Tweedy’s forthcoming album with his son, Spencer, entitled Sukierae, which drops on September 16. 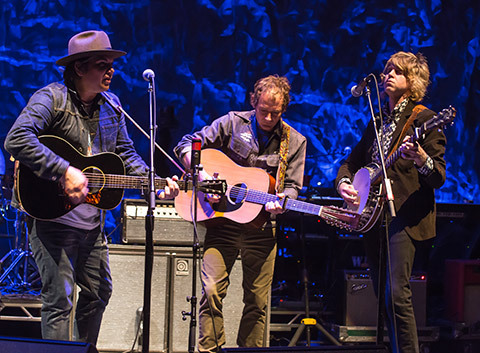 While the Wilco classics are always welcome, the new material was this set’s standout. Tweedy managed to get the audience to sing along to “Slow Love” despite that none of us had heard it before, and “Diamond Light” already looks like another great “jam” song, with a fiery guitar outro that begs for improvisation. There’s plenty more we could say about the set, but for Tweedy fans, the reason to hear this will be clear, and we want to get it out there as quickly as possible. Without further ado, here you go. I recorded this set with MBHO microphones from an area to the immediate right of the soundboard. Despite this being a wide-open outdoor show at a decent distance from the stage, the vocals and general PA sound is clear and direct, and an excellent representation of this performance. Enjoy! Note: All of the material on this site is offered with artist permission, free to fans, at our expense. The only thing we ask is that you download the material directly from this site, rather than re-posting the direct download links or the files on other sites without our permission. Feel free to re-post the Soundcloud links. Please respect our request. After catching Wilco’s excellent show at Terminal 5 earlier in the week, to say that we were excited about trekking up to the lovely Brewery Ommegang in Cooperstown to see them again would be a gross understatement. It’s becoming a bit of a tradition for the entire NYCtaper crew to make it to at least one outdoor Wilco concert a year and we decided to expand our range outside of the city after the superb Central Park gigs last September (HERE and HERE). The tradition also appears to bring rain with it, but judging by the fabulous time both the band and attendees were having you wouldn’t have guessed a single drop fell that night. No doubt the exceptional Belgian-style beers the brewery serves as well as their hospitality and the gorgeous upstate surroundings bolstered our good spirits. It became evident early on that Jeff Tweedy and company were as impressed with the fans as we were with them, citing a checklist of criteria that makes for a great crowd at one point. Along with regular favorites “Heavy Metal Drummer” and “Impossible Germany” (which is always an opportunity for the impressive Nels Cline to shine on guitar), the troupe shrugged off the wet weather with an infrequent showing of “Either Way”, and brought the rare “Laminated Cat” and “What’s the World Got in Store” back into rotation. Topping the evening with two encores, including a triple-shot of songs from ‘Being There‘, it’s nights like these that keep us eager for the next show and make recording them so enjoyable. The rain aside, between the four of us we ran no less than six pairs of microphones and were able to set up very close to center right in front of the soundboard. Having so many choices at hand, we ultimately decided to use acidjack‘s Schoeps and Johnny’s Milabs for our mix. With Wilco’s FOH engineer extraordinaire Stan Doty at the helm, the sound was exemplary and, in light of the weather conditions, our recording is really quite excellent. We hope you like what you hear as much as we did. Enjoy! If you download this recording, we expect that you will PLEASE SUPPORT Wilco, visit their website, visit their Facebook and MySpace pages, and purchase their official releases and merchandise [HERE]. Whereas the previous evening we saw the damp weather held at bay, for Wilco’s second night at Central Park’s Summerstage the band and attendees weren’t quite as lucky. All parties took it in stride and the crowd, despite the rain or maybe because of it, seemed particularly enthusiastic. Once again pulling a lion’s share of tracks from the new album, The Whole Love (which has its official release today), we were also treated to crowd-pleasers “Passenger Side”, “Impossible Germany” and “Heavy Metal Drummer”, and wonderful takes on live staples “Bull Black Nova”, “Misunderstood” and “Jesus, Etc.”, which Jeff Tweedy dedicated to us. 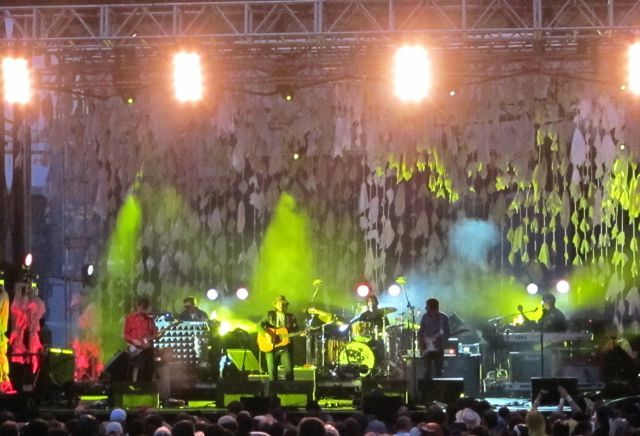 With all the good stuff going on stage, Wilco made it pretty easy to forget about the drizzle on our heads. As with the night before, the entire NYCTaper crew made it out for the concert. Paring down our rig considerably due to the inclement weather, we were still able to get an excellent recording and hope you like what you hear as much as we did. Enjoy! 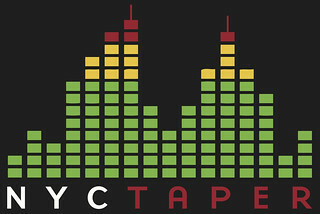 If the FLAC link is no longer working, email nyctaper with a request for the download location of the FLAC files. If you download this recording, we expect that you will PLEASE SUPPORT Wilco, visit their website, visit their Facebook and MySpace pages, and purchase their official releases (including new release, The Whole Love) and merchandise [HERE]. If there’s a band we hope that people associate with what nyctaper stands for, its Wilco. They have appeared so many times on this site that its often difficult to invent new superlatives to describe the Wilco concert experience. Last night at Summerstage, the band again delivered to its fans another epic NYC show, on par with the legendary Irving Plaza or Hammerstein or McCarren Pool shows of previous years. On tour in support of their latest release, The Whole Love (due on September 27), the band again delivered a two-plus hour high-energy set that dug deep into their catalog (an A.M. cut streaming below) while it also featured eight songs from the new album. The title track has already earned encore status, and we’re streaming it below. Of special note was Jeff Tweedy’s remembrance of the Wilco sets at Town Hall almost exactly ten years to the day, when a still-shocked NYC found some comfort in superbly delivered and heartfelt two nights of music. Ten years later, Wilco is still providing the City with the same gifts. The entire NYCTaper crew was on hand to record this set. While we feared the worst of the elements, fortunately the rain held off and the winds were minimal. We set up near the back of the floor because our original advantageous position was actually an obstruction to the lighting projections. The crew ran 3 separate rigs, featuring twelve high-end microphones. This particular recording is my standard Neumann + DPA 4021 rig, and its a surprisingly excellent recording, all things considered. We will likely feature some of the other captures in the coming weeks. Enjoy! If you email nyctaper for access to this recording, we expect that you will PLEASE SUPPORT Wilco, visit their website, and purchase their official releases, including The Whole Love on September 27, directly from their website [HERE]. The last time Jeff Tweedy played in room this small in the NYC area was the better part of two decades ago. As the opener of Yo La Tengo’s third night of Hanukkah, Tweedy seemed to recognize the rarity of the occasion and even communicated a little bit of sentimentality for the old days. The ultra-rare performance of “Gun” (streaming below) brought a reference to Uncle Tupelo having played Maxwell’s in the early 90s. We would catch Jeff play a full show at Bowery Ballroom the night following this show, but for one brief thirty-five minute set, he was back in the past. And that’s a pretty good thing. This set was recorded by local taping legend “Laz”, who mixed a pair of vintage Beyer cards with a board feed for a superb capture. Enjoy! If you email nyctaper for access to this recording, we expect that you will PLEASE SUPPORT Jeff Tweedy and Wilco, visit their website, and purchase their official releases at their website [here]. Jeff Tweedy solo shows are a rare commodity in NYC. By Jeff’s account at Saturday night’s Bowery Ballroom show, he had not played solo in NYC since 2001, and never at Bowery. Despite that we have seen Wilco many times, the only other Jeff Tweedy solo performance we experienced was at the Mercury Lounge in 1997 (also recorded that night). That show thirteen years ago also happened to be the first time I ever heard “Via Chicago”, which would show up on Summerteeth two years later, and which would be reprised on Saturday night (streaming below). But those fans expecting that number and more of the Wilco catalog would learn quickly that this was not a Wilco concert — some of the louder and more obnoxious in the crowd never got that message. To the delight of the diehards, Tweedy worked through some fairly obscure back catalog, including “The Ruling Class”, “Country Disappeared” and “Chinese Apple” in consecutive slots mid-set. We were particularly happy that he delved briefly into the Uncle Tupelo catalog for “Wait Up”, which also reached back to that 1997 show. 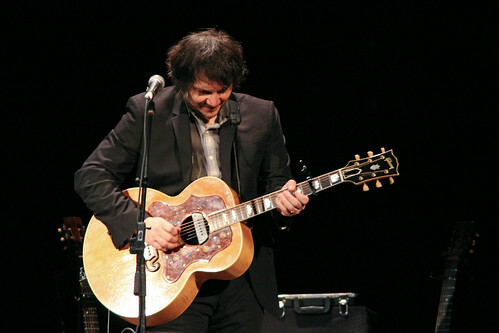 The opening set by John Stirratt and Pat Sansone’s band Autumn Defense offered the opportunity for a mini Wilco set, and in fact Tweedy’s bandmates joined for the first two encores. I recorded this set with the four microphone rig on a high stand from the back rail of the soundboard. This was a challenging recording situation given the quiet music and the crowd noise. The post production consisted of an arduous amount of isolated crowd level reductions, and editing of some of the unfortunate intoxicated rowdiness around me. Overall, the finished product is not superb, but is certainly a pleasurable listening experience. Enjoy! Many thanks to Steve from the Via Chicago forum for the last minute ticket!